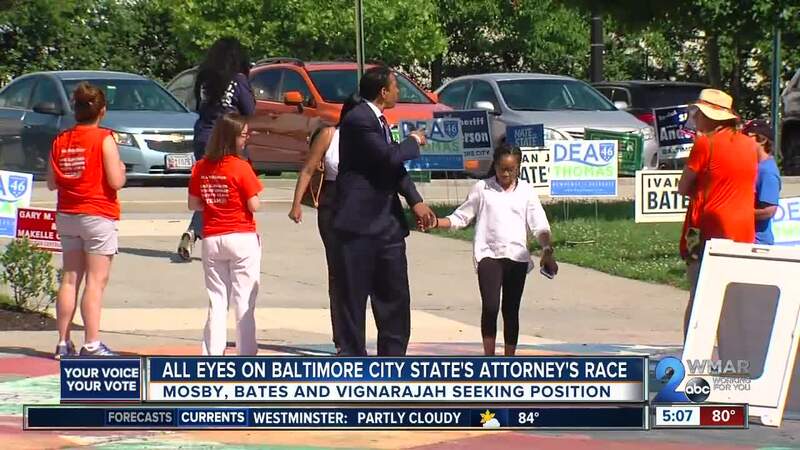 The big race in Baltimore is the State's Attorney's race and it looks like Marilyn Mosby will continue her time in office, according to the Associated Press. Marilyn Mosby has held the position for three and a half years and became the youngest chief prosecutor of any major American city. During her term, she brought charges against the six Baltimore police officers involved in the death of Freddie Gray, but all six officers had their charges eventually dropped or were acquitted at trial. If re-elected she says she plans to target violent offenders. Ivan Bates worked in the Baltimore City State's Attorney office from 1996 to 2002, eventually taking over as Assistant States Attorney. He has served as a criminal defense attorney since leaving that office and has been running on a platform of smart prosecution. If elected he plans on recruiting in new and experienced prosecutors. Thiru Vignarajah has worked as both a federal prosecutor and in the city States Attorney Office, eventually being named Deputy Attorney General for Maryland. His focus during his campaign has been on reducing violent crime by assigning prosecutors to each of the nine police districts and closing the school to prison pipeline. With no Republicans challenging for the position, the winner of the primary election will be the State's Attorney heading into the November general election.